You hear the thud of the body of one of your companions behind you and the flind lifts its flail, whipping the spiked ends of its weapon backward. With a flash the flind lashes its demonic weapon at you. You try to lift your shield, but it’s too late. 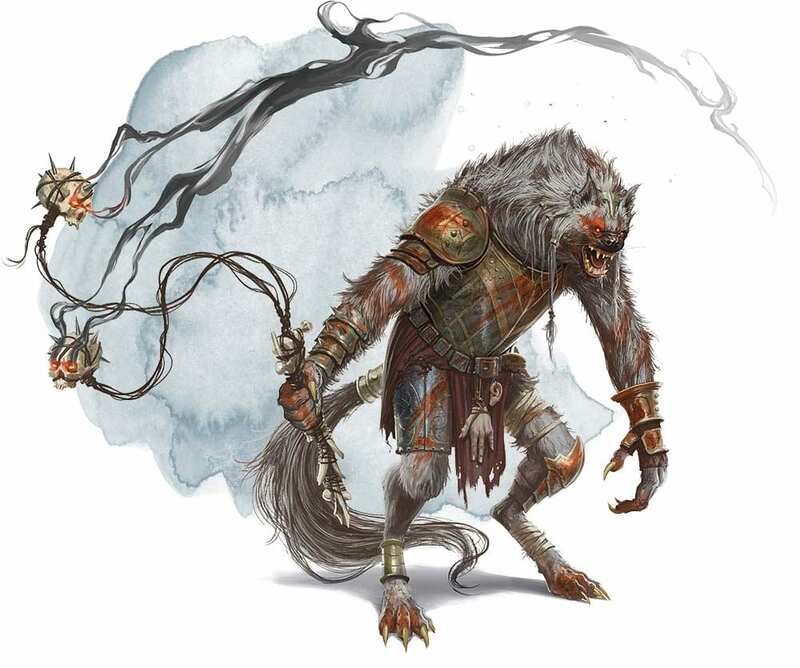 It hasn’t been too long since the last gnoll creature was featured in a D&D Monster Monday, but I figured we’d take a look into another creature from Volo’s Guide to Monsters. The flind is one of the 4 variations of gnolls from that book and it’s an absolute terror. 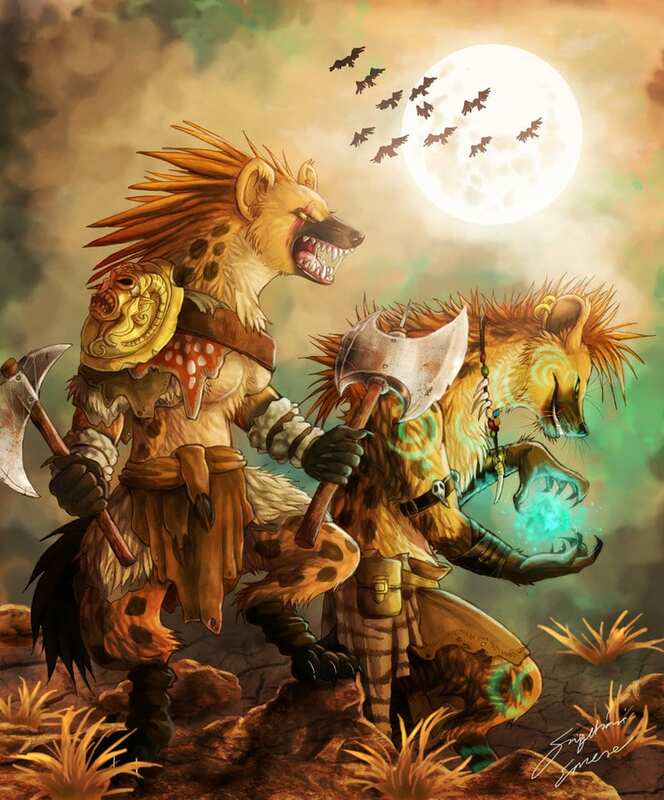 Flinds are the leaders of a gnoll war band and they are everything you’d expect them to be. Evil, fearless, and of course, dangerously violent. They share a special connection to the Demon Lord, Yeenoghu, which makes war bands lead by flinds exceptionally dangerous. 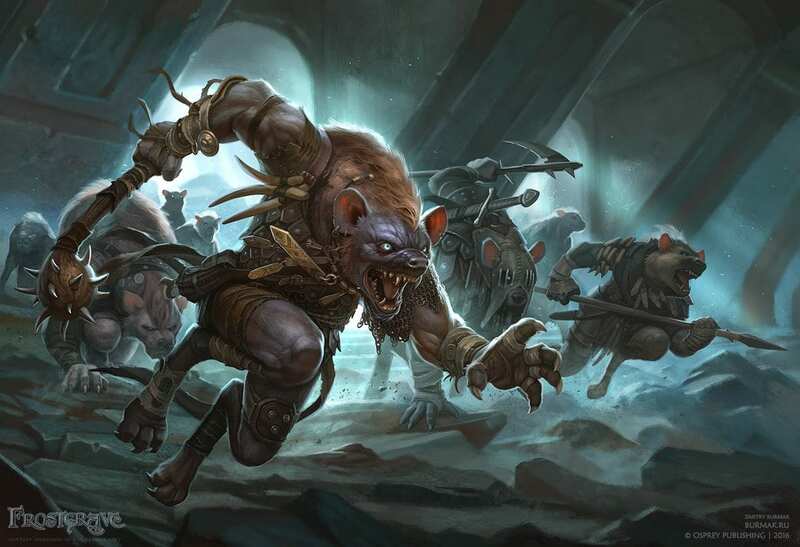 They are much smarter than the average gnoll and use this connection to guide the war band optimally. Flinds rarely find themselves fighting alone and use their leadership abilities to empower the gnolls around them. However, that’s not to say that they are a capable threat on their own. Their magical flail blessed by Yeenoghu makes them terrifyingly powerful melee attackers. I absolutely love the artwork for the flind in 5e. The flail in particular is terrifying. Art by Wizards of the Coast. As I’ve said before flinds are basically the super soldiers of the gnolls. Think Captain America, but with a demonic flail instead of a shield, a lust for blood, and the insatiable urge to pillage and loot. The average gnoll is driven purely by instinct. They instinctively create these war bands and hunt in groups. While they’ll often focus on hunting prey they can easily overcome they’ll sometimes find themselves in predicaments where they do not have such a huge advantage. Flinds though are much smarter. They utilize omens and insight given to them by Yeenoghu to guide their path and find prey that their war band can easily pillage and eat. Their blessed flail is the prized possession of the flind and really one of their defining characteristics. It has 3 different attacks that it can do each with a different ability. They can use this magical flail to subdue their enemies, wreak psychic destruction upon them, or strike madness into the hearts of a foe. Interestingly though a flind is not a leader that stays in the back-lines and barks orders. In most cases, the flind is the first one in the war band to reach the enemy. They lead the charge and lead by example. This helps cement their leadership position and earns the unwavering respect of their underlings. You can find all of this information on page 153 of Volo’s Guide to Monsters. Compared to a regular gnoll a flind is considerably more powerful. They have outstanding Strength and Constitution scores giving them a large health pool and some massive melee attack and damage bonuses. With a +5 Strength bonus, they’ll be very hard to grapple as well. The rest of their skills are average or slightly above average. Compared to other gnolls these are huge bonuses, but still. At first glance, you’d also assume that flinds are easily crowd controlled with Dexterity or Wisdom-based saves. Thankfully due to saving throw bonuses, this is only true for Dexterity saving throws. 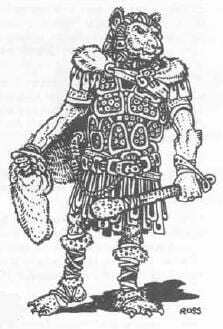 Their Charisma being much higher than the average gnoll makes thematic sense. Flinds are the leaders of their war band, they have to be charismatic. Flinds also have fairly average speed, but their AC is maybe a bit below-average for a CR 9 melee creature. Regardless, their AC is the only bad thing I can say about their base stats. Flinds in 1e looked more like a lion than a hyena. Art by Wizards of the Coast. These massive saving throw bonuses are huge and pretty necessary for a low AC melee attacker. With these bonuses, the only saving throws a flind has to worry about are Dexterity and maybe Charisma saving throws. Flinds are ruthless leaders so it’s very fitting that they’d have proficiency in Intimidate. Their demonic connection gives them the ability to be much more perceptive than the average gnoll. It will be difficult for a party of adventurers to sneak past its demonic gaze. Darkvision is always a plus, and I love the flavor of having a flind know Abyssal. It makes sense since they can commune with Yeenoghu and they have such a strong connection to demons. Aura of Blood Thirst. If the flind isn’t incapacitated, any creature with the Rampage trait can make a bite attack as a bonus action while within 10 feet of the flind. I love this trait. It works extremely well with the flind’s flavor of being an inspiring leader of their war band. The trait also boosts the hell out of the action economy of every creature within a close radius with it. However, it comes with some big flaws that you’ll have to overcome when building out an encounter for a flind. We’ll dive into this topic a bit later since it’s one of the primary weaknesses of the creature. Multiattack. The flind makes three attacks: one with each of its different flail attacks or three with its longbow. Flail of Madness. Melee Weapon Attack: +9 to hit, reach 5 ft., one target. Hit: 10 (1d10 + 5) bludgeoning damage, and the target must make a DC 16 Wisdom saving throw. On a failed save, the target must make a melee attack against a random target within its reach on its next turn. If it has no targets within its reach even after moving, it loses its action on that turn. Flail of Pain. Melee Weapon Attack: +9 to hit, reach 5 ft., one target. Hit: 10 (1d10 + 5) bludgeoning damage plus 22 (4d10) psychic damage. Flail of Paralysis. Melee Weapon Attack: +9 to hit, reach 5 ft., one target. Hit: 10 (1d10 + 5) bludgeoning damage, and the target must succeed on a DC 16 Constitution saving throw or be paralyzed until the end of its next turn. Longbow. Ranged Weapon Attack: +4 to hit, reach 150/600 ft., one target. Hit: 4 (1d8) piercing damage. Gnolls are opportunistic hunters. They pick out weak targets or await demonic orders. Art by LadyFiszi. Three attacks is a pretty significant amount of attacks. Not only that, but your three attacks deal some sizeable damage while also dishing out crowd control. A flind doesn’t have to choose between paralyzing someone and caving an enemy’s head in. They do both. Speaking of paralyzing enemies, due to Aura of Blood Thirst your flind is most-likely not the only creature that will get some juicy hits at advantage against paralyzed creatures. Oh, and any of those melee attacks are a critical hit against a paralyzed target. That’s some massive damage. For reference, Flail of Pain would go from 32 average damage to 59 average damage with a critical hit. Flail of Madness is a fun attack that can be used to force big, front-line enemies out of the fray for a turn. This gives the flind and their allies time to charge into the back-line. While flinds do have low Dexterity they still have the option to use their longbow to pick off enemies from afar. Flinds aren’t dumb if they are in an advantageous position a flind will pull out their longbow and pick off their enemies from afar. In melee range, a flind can deal 52 damage per round on average. About half of that is split between bludgeoning and necrotic damage too which is definitely a benefit. This is also not assuming that any creature has been paralyzed by Flail of Paralysis. Speaking off Flail of Paralysis, that and Flail of Madness have crowd control capabilities both of which require a DC 16 saving throw of Constitution and Wisdom respectfully. DC 16 is a respectable saving throw as well, even characters with proficiency in the respective saving throw will still have a good chance of failure. While they are certainly not great with their longbow, the flind still has the option to stay safely out of the fray or behind some cover and lob arrows at the enemy. It’s not the ideal position for dealing damage for a flind, but it’s absolutely worth mentioning. Having options is always beneficial. Flinds have 3 different attacks they can do with their action. Each of these attacks either deals serious damage or has the potential to crowd control an enemy. This alone is pretty solid. They have 2 attacks that have the ability to take away an opponent’s entire Action. With their Aura of Blood Thirst, flinds become action economy machines. They give out bonus action bite attacks to all of their allies that typically don’t have bonus actions to use. Couple this with Flail of Paralysis and you have a ton of minions getting extra bonus action attacks at advantage. Again, the flind benefits off of having a lot of minions, typically gnolls, surround them at all times. This is useful for both their survivability as well as their damage output and action economy. 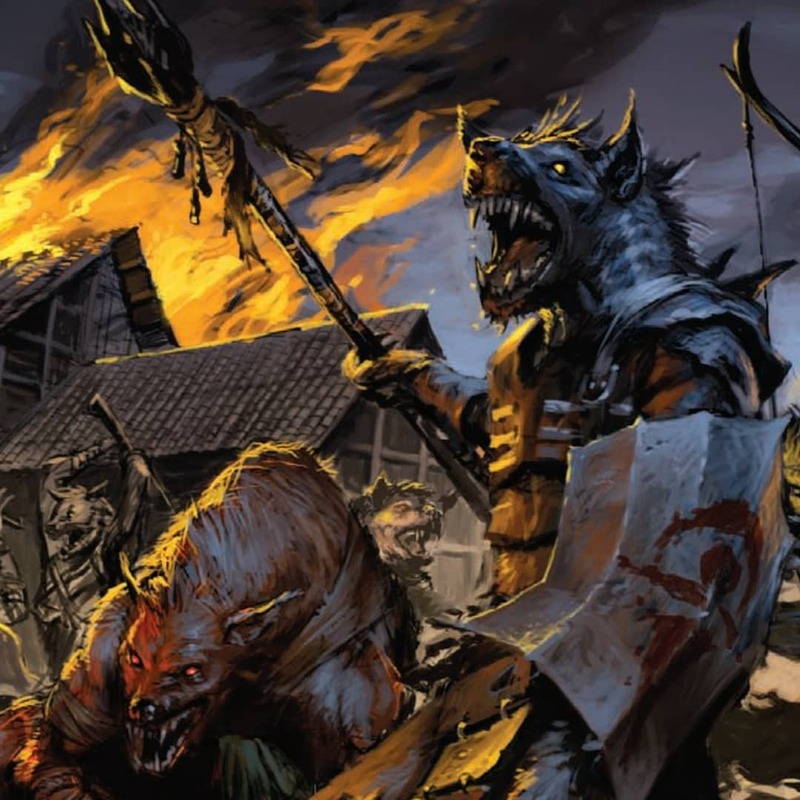 Gnoll warbands have been known to raid villages and small cities. Art by Wizards of the Coast. 16 AC is not necessarily bad, but it’s definitely not great for a creature that thrives in melee range. They’re also a CR 9 creature that is best used with a group of smaller minions. This is not a creature that will be seen by low-level adventurers where 16 AC is difficult to hit. The lack of resistances and immunities while only have 16 AC definitely hurts the flind’s survivability. They do have a lot of HP, but it doesn’t matter much if you have no resistances, mediocre AC, and are designed to aggressively strike in melee. The flind’s greatest source of survivability is by gathering a pack of gnolls and hoping that the enemy uses AoE spells that require Wisdom or Constitution saving throws. Aura of Blood Thirst creates a very unique style of combat. Flinds have a below-average AC and no resistances or immunities and rely heavily on being in melee range. This makes them a very big target for their enemies. Having a group of underlings surrounding them turns them into a very deadly ball of claws and fangs and may make them less of an opportunity for single target attacks. Spellcasters may opt to cast a Fireball or an AoE spell instead which the flind has a good chance of saving against. This doesn’t sound like much of a weakness at first, but it absolutely is. While your flind may be in good health, the rest of their pack of gnolls are probably not. Forcing their companions to group up in a tight formation gives the flind an advantage but sacrifices the rest of the encounter to do so. There are absolutely some concerns for having a large number of creatures in a 10 ft. radius of your flind. They become a massive target for AoE spells and abilities, but this is a risk you absolutely have to take. With Aura of Blood Thirst you give nearby creatures both a bonus action and a chance to land an extra attack. Combo with Flail of Paralysis and you have a swarm of minions to strip the flesh from the bone of a paralyzed creature. Due to their lack of personal survivability, flinds need to use their weaker allies as bait. If they can force the party to deal with them they can spend more time crowd controlling the party with 2 of their flail attacks. Flinds lead the charge towards their enemies. They don’t lead from afar. Art by Osprey Publishing. You have a few choices as a flind, but I find that you are presented with a unique opportunity. You can use your Flail of Madness and Flail of Paralysis to crowd control the party’s heavily armored front-line units and charge past them with your horde into their squishy back-line. Flinds do not have much in terms of survivability. They have strength in numbers and they have a very aggressive kit. They need to dish out what crowd control they can and rush in towards creatures they can easily take down with their Flail of Pain and their allies’ bite attacks. Optionally, if they can paralyze a creature they can order their pack to pick them off rather than opt to rush the back-line. They’re opportunistic hunters and will direct their pack towards their best chance of survival. As you can probably tell I’m a big fan of gnolls. They’re savage, brutish, but they have some very interesting ties to demons such as Yeenoghu. They have such an interesting hierarchy that is animalistic with a lot of demonic influence. Flinds are an excellent addition just like the other gnolls that Volo’s Guide to Monsters brought to us. They build on the war band structure that has already been established while also adding more backstory to Yeenoghu and the inner-workings of gnoll warbands. I love that flinds are aggressive leaders. Too often do we have big leaders of groups of monsters that simply sit in the back, bark orders, and throw their minions up against the party. Flinds are the opposite. They’ll charge right at the moment they have a good opportunity to do so. One thing worth noting is that allied Gnolls only have to be within 10ft when they take their bonus action to make their bite attack. This makes hit and run attacks effective, and mitigates the bunching up problem. Especially against paralyzed targets (no OA) while on their way past to other targets.